Keeping your pet safe has never been more important. 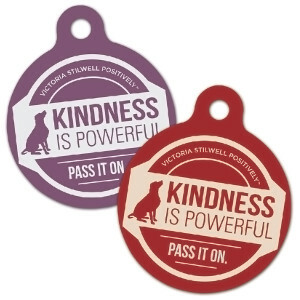 With this exclusive Victoria Stilwell Positively “Kindness is Powerful – Pass It On” premium digital pet ID tag from PetHub, you will have peace of mind that your pets will be protected. If your pet goes missing, anyone with a smart phone can scan their tag, view your pet's profile and get in contact with you. Step 1 – Get Tagged! Purchase your unique premium PetHub Kindness is Powerful Digital ID Tag. Step 2 – Add a pet! Sign up for free and add your best friend to the PetHub National Recovery Database™. Step 3 – Link Your Tag! Make sure your pet is always safe by connecting your tag with the PetHub Protection Program. • Shelter & Community "Amber Alert"